On July 4, we marked, of course, our nation’s birth. At our house, we also marked another milestone, the hanging of a small curtain that you or I or Cristina or Belinda (I can’t remember) knitted up in 2005 as a photography sample for our first book. The photo shoot was in January of that year. It was me and our team of two photographers, Steve Gross and Sue Daley, holed up in Southampton. and nearly snowbound, for two days of intense contemplation of light, shadow and knitwear. The cheap curtain rod I’d picked up at the hardware store was one of those white metal, spring-loaded jobbies that adjusts to fit inside a window frame. Standing there, looking into the kindly, discerning eyes of Steve and Sue–the eyes that had created the magnificent book Old Houses — I knew: this was not going to fly. Steve said, “Wait a minute.” Coatless, he ran outside, rummaged around under a snowbank with his bare hands, and came back with a frozen stick. Sue threaded the curtain onto it, and stuck it into the window frame, where it stayed just long enough for them to take several slow shots on their large-format camera. (Remember film photography? The light-test Polaroids that we meticulously taped into a spiral notebook? Sigh…) It’s on page 44, for all eternity. Overnight, the stick dried up and fell out of the window, and that was the end of that. Recently, in one of my Kon Mari fugue states, I found two joy-sparking items in adjoining kitchen drawers. One: the Bubbly Curtain, circa 2005. Two: an IKEA Dignitet wire curtain rod setup that must have been left there by the Curtain Rod Fairy, as I have no recollection of buying it. This past weekend, niece Kristin–always game for DIY fun, especially if a power washer or shop vac is involved– revved up a drill and installed the hardware. It took her a while to cut the wire to size, using kitchen scissors and a lot of bending back and forth. But now, at long last, Bubbly Curtain is in the window for which it was custom made. Since it’s Euroflax linen, it will be there for a very long time. Oh the good old days of film photography … spring rods in window frames and knitted bubble bathroom curtains … which reminds me they are the solution to a curtain dilemma where the drawn linen hemstitch has frayed and looks frumpy and a LOUET bubble curtain would be the solution … thanks for the fresh view on an oldie but goody Madame!!! Bonne journée and a kiss on Olive’s nose! And this is part of why I love reading you guys. So much normal (doesn’t it take everyone years to hang a curtain?) among creative brilliance. I’m still looking for a reason to knit that curtain that is smaller than my sliding glass door. The linen being both a plus of beauty and a pause for concern to my hands. You can give the linen hank a bath before you knit with it. That’ll soften it up some. I knit that curtain in honor of Ann & Kay doing a book signing at Finely a Knitting Party in Swarthmore, Pa. The curtain is still hanging and we still love Mason Dixon! Thanks for a great pattern and great ideas. Good memories. Aw! Glad to know it’s still there. I’ve needed a smal curtain for a pantry window. Now I know just a what it needs! Thanks! 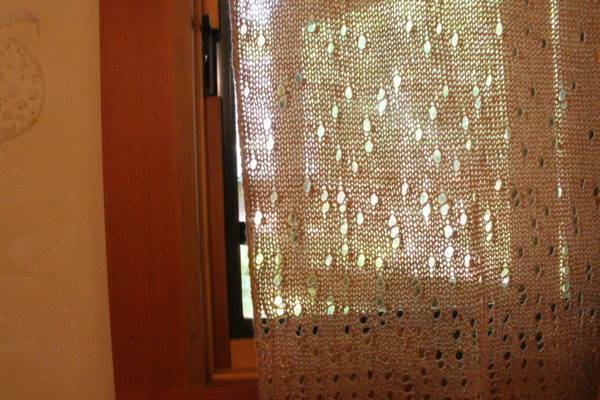 Selling a house in order to knit a curtain seems like a reasonable thing to do. Well yes, this does make me want to knit the bubbly curtain, thank you! Be careful on the long and narrow Bubbly. I love mine, made for a side light adjacent to my door. It is beautiful. I should have made it wider, but made it just-to-fit and the sides curl. It is hanging now, filtering the light beautifully with a lovely pattern of shadows and light down the stairwell. Also, I made mine of cotton, maybe the Louett linen will hang straighter. That’s exactly what I want it for – a side light – so thanks for the advice! Poor bubbly curtain, stuck in a drawer all these years. So glad that it finally met it’s destiny. It was in the “Christmas drawer” so I was reminded of it every year. I was actually looking at Bubbly Curtain on the weekend, and wondering if I could turn it into a smashing linen scarf. I have, somewhere, the perfect skeins of natural linen. It looks SO good in the window, Kay. In my case, it would have been another ten years before I even came across it. I may need to reread Kon Mari…. 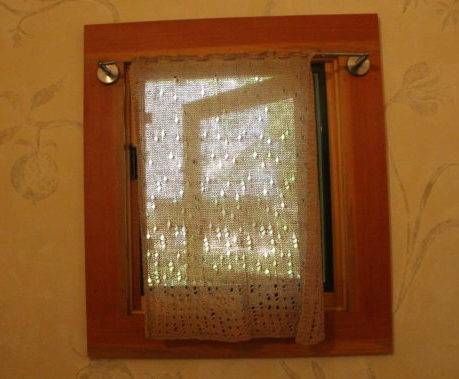 I tried knitting that for the narrow window next to our front door. I’m not sure how many times I started it before I gave up. I was making so many mistakes. Eventually the window seal gave out and we had a chance to replace the clear glass with ribbed glass, and that was that. Oh, I wish I had a little window. Or heck – a little window in Southhampton:)! Hooray, that Bubbly Curtain looks heroic after waiting so patiently. I knit a euroflax linen handtowel with the boxy seed stitch pattern from the first MDK book. It wears like iron, feels sleek as a the bridge of a puppy’s nose, looks great after close to a decade of use. The ball band dish rag changed my life forever. I just folded an extra wide one in half and whipstitched a long and a short side together to make a sleeve for a cheap-o kindle. Almost instant gratification, washable, fun texture, and cheerful colors. Yay!